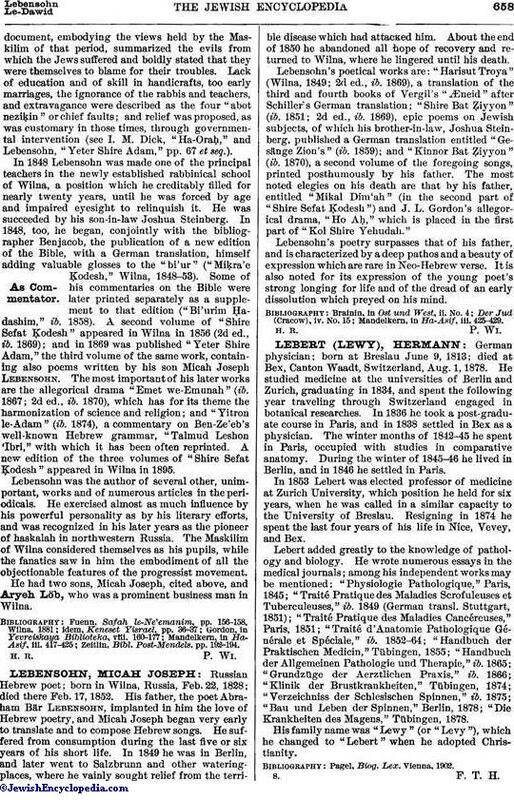 German physician; born at Breslau June 9, 1813; died at Bex, Canton Waadt, Switzerland, Aug. 1, 1878. He studied medicine at the universities of Berlin and Zurich, graduating in 1834, and spent the following year traveling through Switzerland engaged in botanical researches. In 1836 he took a post-graduate course in Paris, and in 1838 settled in Bex as a physician. The winter months of 1842-45 he spent in Paris, occupied with studies in comparative anatomy. During the winter of 1845-46 he lived in Berlin, and in 1846 he settled in Paris. In 1853 Lebert was elected professor of medicine at Zurich University, which position he held for six years, when he was called in a similar capacity to the University of Breslau. Resigning in 1874 he spent the last four years of his life in Nice, Vevey, and Bex. Lebert added greatly to the knowledge of pathology and biology. He wrote numerous essays in the medical journals; among his independent works may be mentioned: "Physiologie Pathologique," Paris, 1845; "Traité Pratique des Maladies Scrofuleuses et Tuberculeuses," ib. 1849 (German transl. Stuttgart, 1851); "Traité Pratique des Maladies Cancéreuses," Paris, 1851; "Traité d'Anatomie Pathologique Générale et Spéciale," ib. 1852-64; "Handbuch der Praktischen Medicin," Tübingen, 1855; "Handbuch der Allgemeinen Pathologie und Therapie," ib. 1865; "Grundzüge der Aerztlichen Praxis," ib. 1866; "Klinik der Brustkrankheiten," Tübingen, 1874; "Verzeichniss der Schlesischen Spinnen," ib. 1875; "Bau und Leben der Spinnen," Berlin, 1878; "Die Krankheiten des Magens," Tübingen, 1878. His family name was "Lewy" (or "Levy"), which he changed to "Lebert" when he adopted Christianity. Pagel, Biog. Lex. Vienna, 1902.